Tara Tarini Sthana Peeth is situated on the holy Taratarini hill (Purnagiri) at a distance of 30 km from Berhampur in the state of Orissa, India. The Twin Goddesses Tara and Tarini are worshiped as manifestations of Adi Shakti. 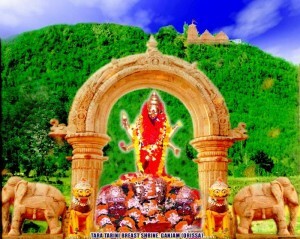 The Taratarini Hill Shrine is one of the oldest pilgrimage centers of Mother Goddess and is one amongst the four major ancient Peethas, which originated from the limbs of the corpse of Mata Sati in the Satya Yuga.Shakti Peethas in India. The mythological texts recognize four major Shakti Peethas,i.e. Tara Tarini (Stana Khanda)near Berhampur, Bimala (Pada Khanda) inside the [[Jagannath Temple (Puri),Kamakshi (Yoni khanda) near Guwahati and Dakhina Kalika (Mukha khanda) in Kolkata among the 4 Adi Shakti Peeths. Apart from these, there are other 52 other sacred Shakti . If we look at Finland then there was Tavastia Proper (Finnish: Kanta-Häme; Swedish: Egentliga Tavastland) is a region (maakunta / landskap) of Finland. It borders to the regions Finland Proper, Pirkanmaa, Päijänne Tavastia, and Uusimaa. Now if we look at Estonia then it retained a pagan religion centred around a deity called Tharapita. The Chronicle of Henry of Livonia mentions Tharapita as the superior god of Oeselians (inhabitants of Saaremaa island), also well known to Vironian tribes in northern Estonia. The above desxcription says that as per Indian mythology there is Tara Tarini (Stana Khanda)near Berhampur. Than Estonia stands for Isht devi? and scandinavia stands for Stana Khand? These all articles are helpful to understand Germanic tribes which latter on called Uralic tribes.